Louth’s Cattle Market came to life with the excited chattering of young voices last Wednesday (February 6) when children from three local primary schools were invited along to learn about agriculture and rural life. The stimulating visit gave Year 5-6 pupils from Utterby, North Thoresby and North Somercotes the opportunity to learn all about where our food comes from, how farm animals are bred, and even the chance to take part in an exhilarating ‘mock auction’ to round off their visit. Rosie Cosgrove, from Louth Young Farmers, introduces North Thoresby Primary Academy pupils to a little lamb! 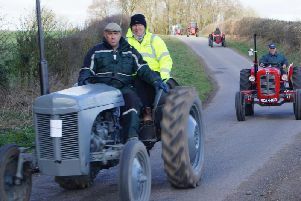 A firm favourite amongst the youngsters was the chance to climb aboard a £140,000 tractor, kindly loaned by Lincolnshire Motors. Oliver said: “I decided to organise this day as I feel education around food production is very limited, if available at all, to the younger generations. One pupil made herself at home in one of the tractor wheels! “With this being the only day of its kind in the area, I think it is going to have a great benefit to all students and schools attending. “With the Louth (Cattle) Market having been saved, it was a good opportunity to utilise the facilities that are here. “Part of the saving of the market was finding a different way of utilising it and make sure we’re using it more than just one day a week, so we’ve found a way that is also educational at the same time, so we’ve been able to kill two birds with one stone. “I’ve organised it all, and as much hard work as it’s been, I think it’s all paid off in the end. Pupils took the opportunity to climb aboard a tractor, kindly provided by Lincolnshire Motors. “We’ve had positive feedback, and hopefully we can do similar events in the future. Jayne Lawrence, who brought along pupils from North Thoresby Primary Academy, said her pupils had really embraced the event. The youngsters were asked to identify fruit and vegetables. Victoria Cass, Y6 teacher at North Somercotes Primary Academy, added: “It’s been really nice to see the children that come from farming backgrounds shine, particularly the children who don’t find the academic side of school quite as easy. “To see them being proud of it is good, because we are in a community where farming still is a big deal, and it’s nice for the other children to see that, and understand the importance of it. Pick up this week's Leader for more pictures from the event.